Pretty boring right? Are you able to see how frequently trains leave at a given hour? which are the rush hours? how many trains leave at 11pm? In fact, it’s really hard to detect any pattern here. 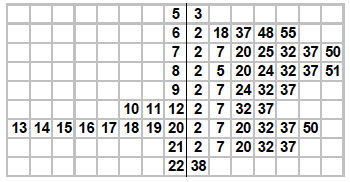 Using a stem-and-leaf plot we can show the train schedule below, where for each departure time, the hour-digits are the stem (left column) and the minute-digits are the leaves (right columns). So hour-digits are not repeated over and over and minute-digits can be stacked, so we obtain kind of an histogram of the departure times. 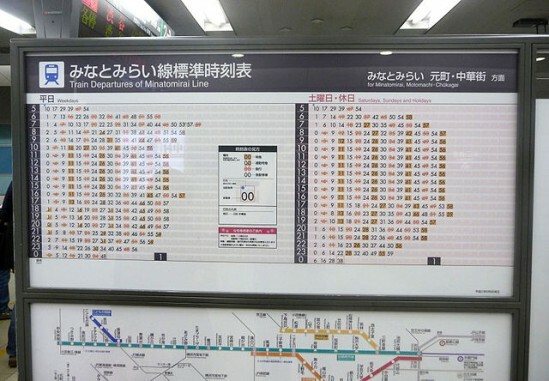 A great example of this technique can be found at many train stations in Japan, where this plot is widely used to display the timetables. The resulting plot is useful, as it gives a quick overview of the departures distributions and it lets also to find an specific departure really fast, which is the main purpose of a train timeable. The graphic is nothing new, and the result is not a stem-and-leaf plot anymore, but it has its roots on it. As you can see, hour-digits and minute-digits are displayed only once, so here the black dots are the departure times. Also the color is used as a visual clue to communicate the density of the departures for each hour/minute departures. Althought the distance between the points is not precise at all (the spatial distance between the minutes is not proportional) , the distance between dots gives you and idea about the time to wait until the next departure. Still some improvements can be added to the graphic, but it illustrates how data can be displayed in a graphical format in order to communicate better the information contained in the data itself. 3 Comments • Give your comment! 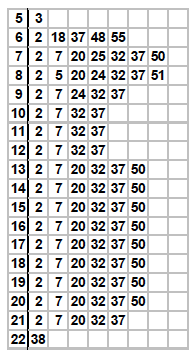 Maybe the last graphic would be even better using the whole time in the cells instead of just points! (just guessing…). Good job anyway! !